An event, “Reimagine Land Records – Join the Conversation” orchestrated by the Legislative Committee of the Minnesota State Bar Association, Real Property Section, took place on October 20th. In attendance were an assortment of County Recorders and other County Officials, Land Surveyors, Abstractors, Attorneys, GIS Specialists, Teachers, Land Records Information Systems (LIS) Software Companies and Title Companies. The session started out with a slide as to what constitutes land records and it was broken down three general categories and who maintains the records and uses them. Objects (Improvements – roads, physical easements, buildings, etc. In the not too distant future, we will feel light-years ahead of today. For those of us who remember typing abstracts on electric typewriters, and getting fax machines in the office, it is truly amazing. Even those who daily toil creating and printing documents, watching people sign, making copies of the signed documents, preparing them for delivery back to the lender and to the respective counties, cutting checks, etc. will see an amazing change. THERE WILL BE NO PAPER. Documents and closings will be “Born Digital.” They will be created in a secure electronic commerce cyber-system, and emailed to the client through a secure web portal. The closer, a licensed, e-sign notary (perhaps hundreds of miles away from the clients,) will see the clients using a web-cam, review their drivers licenses against the online faces, and e-sign their notary as the clients click through, and e-sign the mortgage, deeds, and other documents. NO PERSONAL HANDSHAKES when meeting, no paper, no file folders, no copies, no notary stamps or checks, just cyberspace. If owners need information, it will all reside in the cloud, or on their computer or flash drive. The digitally signed documents will then be electronically submitted back to the lender, with digital copies for the title company, and of course an e-signed digital copy will go directly to the appropriate county (with e-fees) where the documents will move though departments to verify, and reside digitally. Someday, when the owner takes a future home equity line or sells the property, a title searcher will simply go to a computer to look up the digital documents in cyberspace. But there will be only one place to look up all needed information for each piece of real estate. A Geographic Information System, accessed by a PIN number (a smart number that ties to Sec- Twp-Rng-1/4 -1/4 and parcel) will open up a Pandora’s Box of information. We will be able to access anything you can imagine about real estate – the physical properties of buildings; terrain; topography; zoning; ownership rights, title and interests; roads; utilities; flood information; zoning; Homeland security; layer after layer. Records from the – Treasurer, Auditor and Assessor that include current and delinquent taxes (Green Acres, etc. ); type of property (single family 3BR, 3BA, 2 story, 2300 sq ft….home); Register of Deeds and Registrar office information (with the ownership, restrictions, easements, mortgages, etc. ); District Court files (showing judgments, divorces and court filings against the owners); Death and Probate Court documents; Health and Human Services information (maps of wells and lien information); Federal District Court filings; Dept. of Transportation (updates on roads and widening of streets); Department of Natural Resources; Wind farms; Detailed utility information; FEMA flood maps; City zoning data; Trash bills; Photos of the property with GIS overlays and on and on. And the records will solve problems besides title searches for many – FEMA, 911, DOT, Homeland Security, Minnegasco, Xcel, public utilities, – when a hurricane or tornado blows through, FEMA can overlay the GIS of the hurricane and know the owners names and rough amount of damage to the property. 911 will have better access to helping people,, because they will estimate number of people impacted, where the nearest hospitals are, and fastest routes to get people there. The DOT will estimate road damage will know where to concentrate their efforts. Gas and electric companies will know where the gas and power are out, and how to proceed as quickly and effectively as possible to make needed repairs. It’s hard to believe, but the pieces are already there, it’s just (just???) that all the pieces need to be joined into one access point. 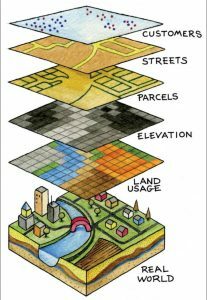 The future of GIS is coming and it will be interesting.